These ten climbs stand out for me. I can't say they are my favorites, because my impressions of a climb are affected by the weather, my partners, and all too many other variables. But the day I did each of the climbs listed here, it was really special. Not in any special order. Note: I did feel some obligation to share the love around so as not to seem partial to one range over another. Mt. 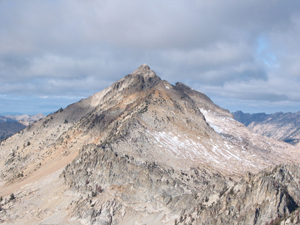 Borah, in the Lost River Range, is Idaho's highest peak. Because of that, it is extremely popular. 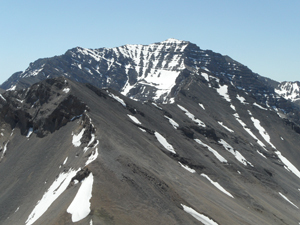 People climb it and marvel at the desert peaks in this basin-and-range topography. However, on the north side there is a secret: snow and ice like the Canadian Rockies. Just hiking back into the hidden basin is a treat. Climbing that awesome face is special. 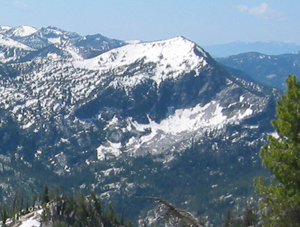 This peak is on one of the most popular routes in one of the most popular backpacking routes in the state. Drop your pack and do the improbable scramble and gain a spectacular view. Along the way, several impossible-lookiing obstacles yield to the dedicated scrambler- it's not really bad at all! Finish by hiking out one of the most popular backpack trips in the Sawtooths. This Pioneer peak doesn't stand out much, nor is it well known. But of all the wild peaks in Wildhorse Canyon, Brocky might be the most spectacular. But be prepared. This is a long 4th class climb- not just a section or two, but sustained. 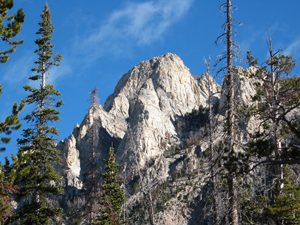 And sustained excitement as you then downclimb your route..
Idaho's Sawtooth range has lots of great rock climbs, but of the ones I've done, this is the best. It's rated 5.8 (we rated it 5.7 when I first did it in the 70s). By today's standards, 5.8 isn't that tough. But the Book is sustained, so it's not an isolated 5.8 move- it's consistently challenging for several pitches. Finish by crawling under the summit, then a spicy mantle to the tiny, exposed top. The Pioneers have lots of semi-remote scrambles. I chose the Fin over several others that I love because it gets you into the far end of Copper Basin, and looks scary. Plan on your descent taking as long as the climb. The White Clouds are not known for their high-quality rock. But I thought the scrambling on the south side of Castle was superb. And if you can see a peak from almost everywhere, one really should climb that peak. Revel in the fact that this area was narrowly saved from becoming an open-pit mine, partly by the promotion of its beauty through the publicity generated by a winter ascent. The peaks around McCall don't get a lot of attention, mostly because no one knows about them. And I suppose because they aren't that high. 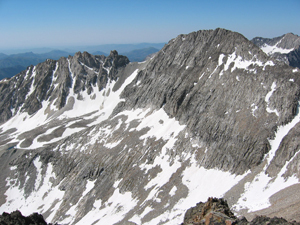 But if you want adventure and solitude, Sawtooth Peak's mile-long summit ridge with sparkling white granite provides wonderful scrambling (or drop below and hike easy terrain amongst the profusion of alpine wildflowers). To many, the Lemhi range seems sort of like an afterthought to the Lost Rivers. But the stupendous Middle Canyon provides a neck-craning approach that you'll rarely find on any other peak; the approach alone is worth it! And a nice view from the top, too. 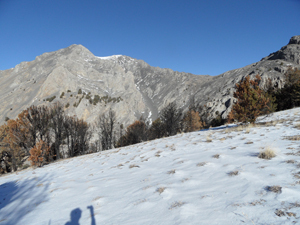 Hundreds of folks look at this Lost River peak each year as they cling to Chicken Out Ridge on the regular route up Borah. But if Chicken Out made your knees wobble, this is not the peak for you. True 4th class (but with easier go-arounds), an even longer ridge, and no tread or cairns to help you navigate, it's a real adventure. And just as much vertical as Borah, because you have to climb UP to descend Chicken Out to get home. I struggled with putting this one on the list. It's a great climb, but the Lost Rivers are full of great climbs. What sets this climb apart is the incredible valley found on approach, then the challenging route. Check your snow conditions- you'll want a nice, cold morning for the long 45-50° slope. Okay, so this is #11. But it really is perfect. It's a short, easy approach to a stiff hillside, a wandering ridge route that is an adventure, and a 4th class finish to a tiny summit overlooking what is possibly the #1 basin in the Sawtooths. 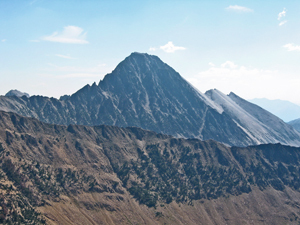 I climbed this ridge two days before climbing the Upper Exum on the Grand Teton, and was struck by the similar rock. And it's only a couple miles from the trailhead. Despite easy access and great climbing, you're unlikely to see anyone as you gaze across the awesomeness that is Wildhorse Basin.